For a Quote, Contact us HERE! manufacturing industry leading steam and hot water valves. stainless steel orifice for long life and durability. Parker Lead Free Hot Water and Steam Valves for Industry. 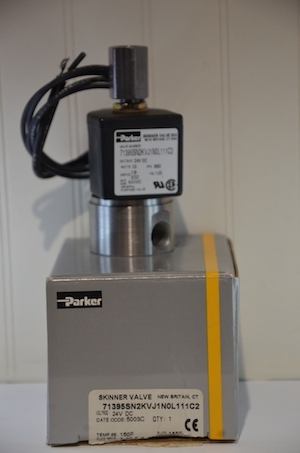 Applications for this Parker Skinner 3-way solenoid valve include; pilot valve for an air valve, pilot valve for cylinders, diverting valve for air or water, and other general purpose valve uses. 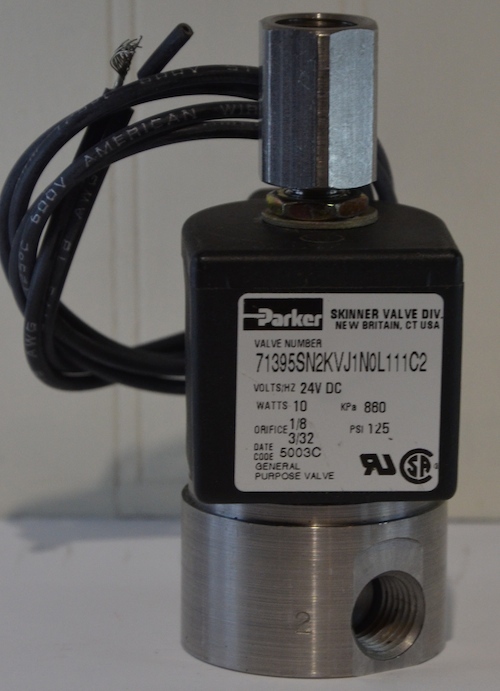 The Parker 71395SN2KVJ1N0L111C2 is a 1/4 inch valve, rated to 125 PSI and css with a 24vdc NEMA 4 coil. The coil can be changed to 12 vdc, 24/60, 120/60 or 240/60. Buy the Parker Valve 71395SN2KVJ1NOL111C2 HERE! Buy Penberthy Emerson GH Series Eductors HERE! • Simple design with no moving parts to wear out. • No lubrication required. • Easy to install without special structures or foundations. • Cast, fabricated or non-metallic constructions. • Variety of materials to suit specific characteristics of the process liquids. no abrupt turns or steps, producing the most efficient flow during the motive function. Suitable for a broad range of applications including: handling condensate, pumping wells, circulating solutions, emptying cesspools, pumping brine solutions, extracting solvents, draining cellars, pumping out barges, acidifying, causticizing oils, producing emulsions,elevation water. All Emerson jet pumps operate on the principle of a fluid entraining a second fluid. Although design and construction may vary, this applies to all jet pumps. Inlet - The operating medium (liquid or steam) under pressure enters the inlet and travels through the nozzle into the suction chamber. The nozzle converts the pressure of the operating medium into a high velocity stream, which passes from the discharge side of the inlet nozzle. Suction - Pumping action begins when vapor, gases or liquid in the suction chamber are entrained by the high velocity stream emerging from the inlet nozzle, lowering the pressure in the suction chamber. The resulting action causes the liquid, gas or vapor in the suction chamber to flow toward the discharge. Discharge - The entrained material from the suction system mixes with the operating medium and acquires part of its energy in the parallel section. In the diffuser section, part of the velocity of the mixture is converted to a pressure greater than the suction pressure, but lower than the operating medium pressure. ALL Emerson Penberthy Jets can be found HERE! Marvin the Maintenance Man wants to help you troubled shoot Solenoid Valves. BUY valves HERE! Contact Flow Factor HERE! Whoops: "Throw the extra parts away." All parts must be assembled correctly for the valve to operate properly. Whoops: "I only hit the valve ONCE with my hammer." A hammer is not a trouble shooting tool. Valve abuse contributes to the most reported problems. Whoops: "We don't need a special wrench; I'll find something to take the valve apart". Special tools for the valve disassembly may be needed. Pipe wrenches etc. will damage parts. Whoops: "I'll add more teflon tape." Gobs of tape will block internal passages and interfere with seating. (These are not ball valves). Whoops: I forgot to turn on the electricity." "I forgot to open the hand valve." "A strainer takes up too much room." Beware of Marvin Maintenance. Whoops: "It's only 10 PSI more than maximum operating pressure." "It's almost at the minimum operating pressure." " Voltage is not that important." Name Plate Data Applies. Whoops: "I throw them away." Installation and maintenance instruction sheets have trouble shooting hints, maintenance notes and assembly instructions; etc." Do Not Throw Them Away. Whoops: "So I piped it up backwards and/or upside down." Proper Mounting is IMPORTANT. Whoops: "We're out of 1 inch pipe, so I used 1/4 inch pipe." 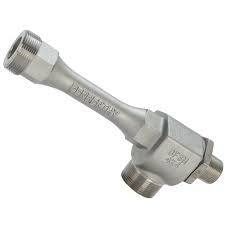 Valves, especially 3-way and 4-way valves, should not be restricted. Whoops: "Well it operated pretty well for the past 20 years." A maintenance program is suggested. Whoops: "The Valve is defective." "The Valve does not operate." "The Valve Failed." Not very descriptive. Find out part number and get application data. Whoops: "I need the silver thing." = Solenoid Sub Base Assembly. "I need an orifice." = Not a spare part. Buy a new valve. "I need gasket." = Specify which one. "I need plunger." = Core Assembly. Whoops: "What is a Kit?" Do not replace individual parts. Use a kit to replace all the wearable parts and restore the valve. Call for kit # or look on name plate. Whoops: "Buy any two way valve, they're are all the same." Misapplication problems can be avoided. Whoops: "I can trouble shoot anything!" We believe you Marvin. 1. Do Not Select Oversized Valves. Size Carefully for Flow and Cylinder speed. For Economy and reliable operation. 2. Use Full Area Lines in Pressure and Exhaust. 3. I.D. (Internal Diameter) of lines and fittings must be larger than orifice. 4. Differential Between Pressure and Exhaust must exceed the minimum at all times. 5. Do Not Meter Flow in Pressure or Exhaust Lines. 6. Install Speed Control Valves in the Cylinder Lines Only. 7. Avoid Pressure Regulators if Possible. If essential, the regulator must have flow capacity to maintain the MINIMUM Differential at all times. 8. Hydraulic Pumps or Air Reservoirs must have adequate capacity to maintain the minimum DeltaP at all times. 9. Pressure Differential may be measured by means of gages installed immediately at the pressure and exhaust connections. 10. Do Not Mistake a Faulty Cylinder for a valve malfunction, Isolate the Cylinder. 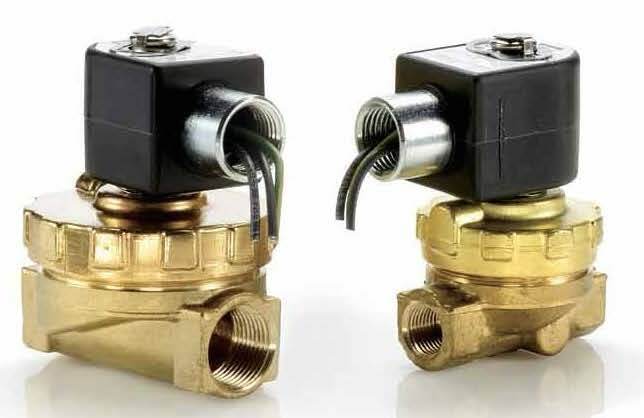 Get a solenoid Valve Quotation HERE! Buy Penberthy Emerson GL Series Eductors HERE! The Robertshaw Excalibur 7000 offers both a smart RF capacitance microprocessor-based level transmitter and PID controller, providing the flexibility to meet all level application requirements. Get a Quote for the Robertshaw Excalibur Here! The Robertshaw EXCALIBUR 7000 offers you TWO INSTRUMENTS FOR THE PRICE OF ONE. Both a SMART RF capacitance microprocessor based Level Transmitter and PID Controller, this unique instrument provides the flexibility to meet all your level application requirements. The Excalibur 7000 has built-in PID Control with AUTO TUNE to eliminate offset and provide accuracy and stability. The auto tune feature eliminates periodic on-line tuning by automatically matching control action with your particular process characteristics. This feature alone eliminates many hours of fine tuning to your particular process and the need for, and the cost of, a separate controller. Patented optional RF anti-coating circuitry eliminates errors due to product build-up on the probe assuring you of accurate level measurements in all types of coating applications. Robertshaw's patented Pulse Frequency Modulated (PFM) transmitter technology provides digital transmission up to 1 mile using economical standard twisted pair wire. This eliminates the cost of more expensive coaxial or triaxial cable and provides no-loss accuracy eliminating errors typically found with analog transmission. Built in field selectable input linearization allows open channel flow measurement and level control with volume conversions for non-cylindrical or horizontal cylindrical vessels. Setup is simple - just select from the menu. This eliminates programming at the factory, entering of time consuming strapping tables, and allows the user flexibility to use the same controller if his application changes. Everything can be done with direct keypad entry. Calibration can also be accomplished without completely emptying or filling the vessel. This feature is in-valuable where tanks are emptied and filled only once or twice a year during shutdown. All Setup and Calibration entries can be password protected with a selection of three distinct levels of access. Calibration also offers selection of Engineering Units, type of variable(s) to be displayed, measurement of level and /or volume or flow, etc. Non-volatile memory insures setup and calibration data is retained if electrical power is lost. No battery backup is required. Displays are abundant to keep you informed of setup parameters selected, calibration data, setpoint, process variable, alarm status, error codes, etc. In all there are two (2) five digits LED displays ( one green and one red), typically used to display the measured variable and control setpoint; one 2 line by 20 character alpha-numeric vacuum fluorescent display (visible in any type of lighting) for menu prompts during setup/calibration and configurable as to the data displayed during normal operation; eight (8) LED controller status indicators and eight (8) LED alarm status indicators. These displays give you a wealth of information at a glance. Relay options include two or four SPDT 10 amp relays with independent selectable differential and time delay on each. All relays are also field selectable High or Low Level Fail Safe to suit the customer's particular safety requirements. Power supply requirement is 120/240 VAC that is switch selectable in the field. Output is isolated 4-20 mA. Adjustable response time to handle agitated or wavy processes is standard. Continuous Self-Diagnostics and remote Test/Verify push-button insure you of constant reliability and safety. Error codes appear on the vacuum Fluorescent Display when failures occur. This self-monitoring feature increases instrument stability and accuracy, eliminating the need for ongoing manual calibration checking, reducing downtime, and improving system performance and quality control. It permits early detection and identification of sensing problems before they lead to a major breakdown. The test feature allows conformance to local and federal environmental regulations. A variety of sensing probes are available to suit any application; high temperature/pressure, sanitary, flanged, inactive lengths, grounded for non-metal vessels, rigid, flexible, bare or insulated. Lengths are available up to 100 feet. n summary, the Robertshaw EXCALIBUR 7000 packs more features and benefits into one package than you will find anywhere. It provides local or remote calibration capability, greater measurement accuracy/stability, lower startup costs, reduced maintenance costs, quality control, and lower design costs. It provides flexibility of configuration or reconfiguration. Features and options can easily be added in the field by simple plug in modules. It provides self-monitoring/self diagnostic capability. This transmitter/controller will suit ALL your level Applications... save time, money, and reduce your parts inventory. Applications are unlimited!!! These include level and/or interface control in all storage or process vessels containing liquids, granulars or slurries. This includes the chemical/petrochemical, petroleum refining, water/wastewater, food and beverage, electric power, pulp and paper, pharmaceutical, mining and primary metals industries. 4-20 mADC into a 650 ohm load max. Standard & Low Span PFM Transmitters and Probe are certified as intrinsically safe for Class I, Division 1, Groups A, B, C & D; Class II, Division 1, Groups E, F & G and Class I, Zone 0, Group IIC when connected as shown on drawing #907GA811 (barrier required). 2 relays, No Analog output, no communications and standard mounted PFM Transmitter NEMA 4X (probe Mounted). No relays, Analog output, no communications and standard mounted PFM Transmitter NEMA 4X (probe Mounted). 2 relays, Analog output, no communications and standard mounted PFM Transmitter NEMA 4X (probe Mounted). Get a Quote for the ROBERTSHAW Excalibur Level Controller Here! 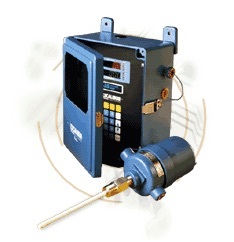 Capacitance Level Probes are not included as they can be any of a number of part numbers, lengths and rigidity. The probes need to be quoted separately.